고려시대에 승려 도선이 창건하였다고 전하는 만복사의 옛터에 서 있는 탑이다. 원래 이곳에는 절터 중앙에 목탑이 있었던 것으로 추정되고 있으며, 1979년부터 1985년까지 7차에 걸친 발굴조사로 많은 건물지와 다수의 유물이 발견되었다. 현재 탑은 4층까지만 남아있고, 5층 이상은 모두 없어졌다. 탑의 받침대 역할을 하고 있는 기단부(基壇部)는 땅에 파묻혀 있는데, 이는 훗날 이 지역의 땅바닥이 높아졌기 때문으로 보고 있다. 탑신부의 1층 몸돌은 대단히 높고 2층 이상은 약 3분의 1로 크기가 줄어 들었다. 몸돌에는 모서리마다 기둥 모양을 조각하였고, 지붕돌은 밑면 전체가 위로 들려 있어, 마치 목조건축의 지붕을 보고 있는 듯하다. 특이한 점은 각 지붕돌 위에 몸돌을 괴기 위한 별도의 네모난 돌이 끼워져 있는 것으로, 당대 석탑의 특징을 보여주는 한 예이다. 이 탑은 고려 문종 때인 11세기에 세워진 것으로, 1968년 이 탑을 보수하다가 탑신의 1층 몸돌에서 사리장치가 발견되기도 하였다. 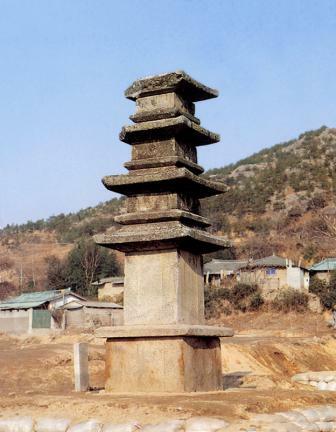 Built in the 11th century (during the reign of King Munjong), this pagoda stands on the original site of Manboksa Temple, which is said to have been established by the Buddhist Monk Doseon during the Goryeo Dynasty. The top part (above the fourth story) of the original pagoda is missing, leaving only a four-story structure. 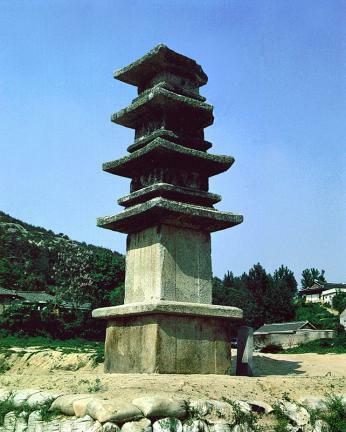 It is assumed that a wooden pagoda originally stood at the center of the temple site. The sites of numerous buildings and other relics were discovered here during seven excavation works conducted at the site between 1979 and 1985. The stylobate was found buried under the earth - presumably due to subsidence around the pagoda. 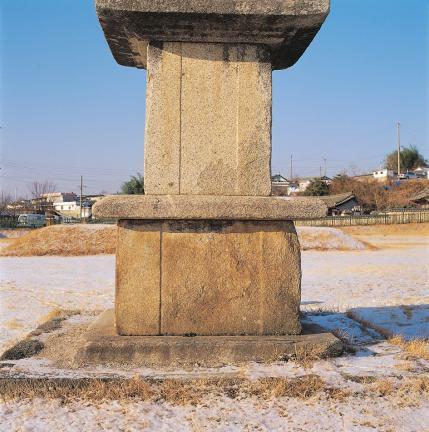 The core stone of the first story of the main body is very tall, while those above the second stories are one third as short as the first story one. 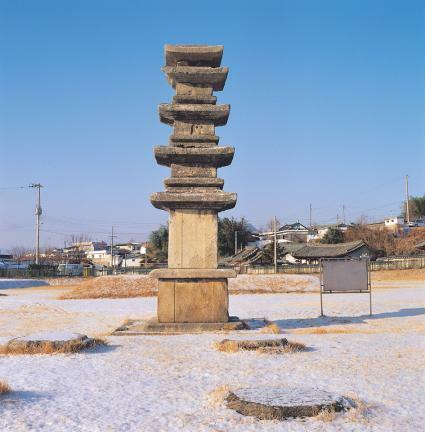 The edges of the pagoda’s core stones are engraved with a pillar pattern. 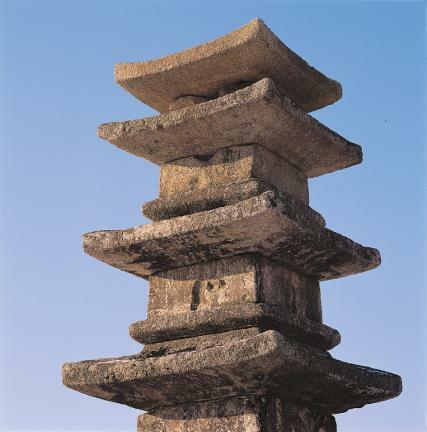 The upward curve along the bottom of the roof stone gives the pagoda the look of a wooden structure. A square stone is inserted into the roof stone to hold the core - a characteristic feature of the architectural style of that time. A sarira reliquary was also found during the renovation of the pagoda in 1968.